D L CO NO VII (1916) The 72 ton scow D L Co No VII was wrecked at the Bering River August of 1916. D L CO NO XLIX (1948) The 297 ton 110 foot wooden scow D L Co No XLIX stranded and was lost February 23, 1928 at Makchanik Island in Chignik Bay. D & M II (1962) The 84 ton 110 foot steel barge D & M II foundered September 4, 1962 off of Ocean Cape. DAKOTA (2002) The 50 foot seine fishing vessel Dakota burned September 25, 2002 in Izhut Bay on Afognak Island. The two crewmembers aboard escaped by skiff to the beach. A U S Coast Guard Helicopter responded to their distress call and transported them to Kodiak. DALMATIA (1975) The 12 ton oil screw Dalmatia foundered July 14, 1975 approximately 7 miles south of Naknek. DANIELLE (1983) The vessel Danielle was lost February 16, 1983 on the rocks near Shuyak Island north of Kodiak. DARLINE C (1983) The seiner Darline C was consumed by an engine room fire and lost September 5, 1983 near Old Harbor. DASHING WAVE (1891) The 106 foot wood schooner Dashing Wave stranded and was lost Saturday April 15, 1891 at 3:00 p.m. at Coal Bay. The vessel had left Sand Point earlier that day with eight crew and 120 tons of general merchandise and was bound for Isatok. Conditions at the time of the casualty are listed as “Thick snowstorm and strong currents.” “Storm, gale, snowing, heavy seas, daylight.” No crewmen were lost, but the Dashing Wave and her cargo were. DAUNTLESS (1973) The 91 foot halibut and crab fishing vessel Dauntless disappeared with all hands on a trip from Ketchikan to Kodiak. The vessel left Ketchikan October 16, 1973 and was never seen again. Lost were skipper Arne Madsen, Trond Loken, John Qvilaug and Kaare Leksas. 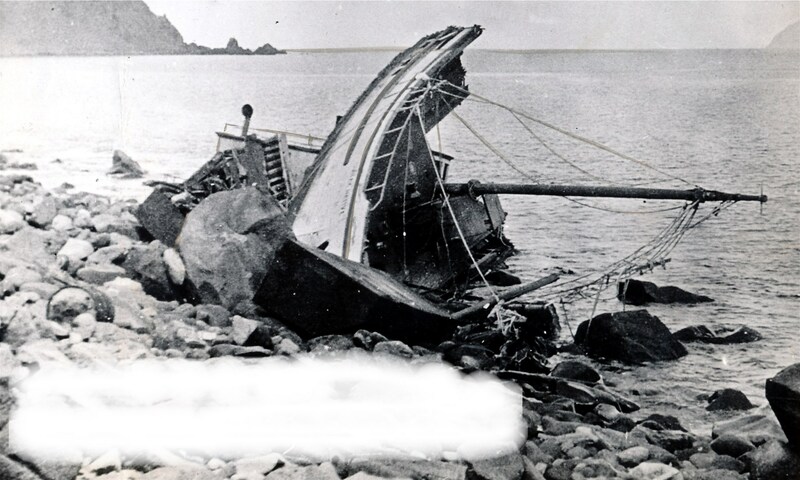 DAVEY LYNN (1952) The 7 ton 32 foot wooden gas screw fishing vessel Davey Lynn stranded and was lost February 12, 1952 on Egg Island off of Whale Island Point in Marmot Bay. DAVID FOSS (1975) The tug David Foss flooded from the stern and sank in 10 fathoms of water January 11, 1975 near Cape Kasilof in Cook Inlet. The vessel was engaged in tending an oil rig in icy conditions. All six crew members escaped to safety. DAVY-J (1964) The 13 ton 38 foot wooden gas screw Davy-J was reported lost in the Good Friday earthquake of March 27, 1964 at Kodiak. DAWN L (1985) The 45 foot fishing vessel Dawn L exploded and sank July 12, 1985 off of Axel Lind Island in Prince William Sound. The Dawn L was tied to the 63 foot fishing tender Alliance and was refueling. The Alliance also sank. All seven persons aboard the two vessels survived. DAYDREAMER (1996) The 39 foot fishing vessel Daydreamer stranded on a reef and was lost January 14, 1996 near Hog Island outside of Afognak Bay. All four persons aboard made it to safety. DAY’S END (1990) The 31 foot fiberglass salmon fishing vessel Day’s End capsized September 29, 1990 off of Montague Island. The operator, who had a history of blackouts, was lost. DEBBY (1972) The 30 foot wooden diesel powered fishing vessel Debby burned June 25, 1972 at False Pass. DEBBY JOANN (1990) The 38 foot fiberglass fishing vessel Debby Joann sank in five fathoms of water July 7, 1990 in Cook Inlet off of Kasilof. The sole occupant of the vessel was rescued. DEBORAH D (1990) The 99 foot wooden fish tender Deborah D grounded, was holed and sank while at anchor April 26, 1990 in Ursus Cove. DEBS (1951) The 18 ton 39 foot wooden gas screw fishing vessel Debs exploded and burned August 9, 1951 in Valdez Arm six miles from Valdez. DEEP SEA (1942) The 54 ton 70 foot wooden oil screw Deep Sea stranded and was lost at Anchorage November 26, 1942. DEEP SEA (1976) The 72 foot fish tender Deep Sea sank August 26, 1976 in Whale Pass. The vessel was on her way to Kodiak from Mush Bay. All 8 persons on board were lost including skipper John W. Nichols of Dallas, Valerie McRae (23), her 20 month old daughter Heather McRae, Kathy McRae (19), Molly McRae (18), Earl McKee, Barney Eldridge and 5 year old Cy McAvery Rodgers. Most of those lost were from the Helena area of Montana. Winds of 50 knots and seas 15 to 20 feet were reported in the area of the loss. The vessel was able to get out a May-Day call which was received by the Alaska Marine Highway Ferry Tustamena. When responding vessels arrived on scene only life vests, the unopened canister of the life raft, a power skiff and a portion of the bridge of the Deep Sea were found. The lost vessel was a fish tender owned by the New England Fish Company. DEFIANCE (1934) The 27 ton 47 foot wooden gas screw fishing vessel Defiance foundered off Anchor Point July 25 , 1934. The three crewmen aboard made it to safety. The Delaware, valued at $5,000 and her cargo were lost but the crew survived. DELIVERANCE (1980) The 40 foot fishing vessel Deliverance foundered January 22, 1980 off of Marmot Island. Dave Dowie was the only survivor. Lost with the Deliverance were Butch Miller and Charles Cochran of Kodiak. DELPHINE (1903) The launch Delphine was lost at Karluk in 1903. The Delphine was valued at $900 with cargo. DEMETRA M (1993) The 34 foot longline halibut fishing vessel Demetra M rolled, filled with water and sank while at anchor July 1, 1993 in Emerald Cove, Columbia Bay. DENIA M (1961) The 19 ton 39 foot wooden gas screw fishing vessel Denia M foundered September 9, 1961 off of Bold Cape near King Cove. DESIREE C (1996) The 38 foot fiberglass fishing vessel Desiree C capsized and was lost in 25 foot seas April 4, 1996 one mile north of light #8 in Chiniak Bay. The two crewmembers onboard, Jack Christiansen (41) and Larry (Lolly) Larionoff Jr (24) were lost with the Desiree C.
DESTINY (1994) The 32 foot gillnet fishing vessel Destiny caught fire and sank June 22, 1994 at Port Moller. All four crewmembers were rescued by another fishing vessel. DESTINY (2000) The 96 foot steel crab fishing vessel Destiny flooded and sank in 90 fathoms of water April 20, 2000 northwest of Rocky Point on the west side of Kodiak Island. All five crewmembers donned survival suits and abandoned ship to the life raft. They were rescued by the vessel Polar Star. DIANE LYNN (1982) The 29 foot vessel Diane Lynn sank June 4, 1982 off of Hanin Rocks near Kodiak. The four persons aboard swam to shore and were picked up at Spruce Cape. DIANE O (1981) The 26 foot fishing vessel Diane O drifted into the surf when her engine failed and broke up October 27, 1981 on the south shore of Nunivak Island. DIOMEDES HERMAN (1882) The 12.86 ton schooner Diomedes Herman drug anchor in a strong easterly gale November 13, 1882 in Chernabura Harbor in the Shumagin Islands. The vessel was blown against a steep bluff which tore a hole in her side. The Diomedes Herman was given up as a complete loss but her cargo of provisions, dry goods and firewood was salvaged. The two passengers and two crewmembers survived the wreck. The vessel was valued at $600 and her cargo at $1,000. She had departed Belkofski October 30 for Chernabura Island. The Director was valued at $3,000 and her stores and fuel at $800; both lost no insurance. The crew survived the accident. DISCOVERER (1929) The oil screw Discoverer stranded 12 miles SW of Gore Point April 5, 1929. DISCOVERER (1932) The 38 ton 55 foot oil screw passenger vessel Discoverer foundered at Ninilchik December 23, 1932. The four persons aboard made it to safety. According to the wreck report, along with the Discovery an estimated 30 passengers and crew were lost including J W McGrath, Charles Mokler, Ed Nord, Guy Trolford, Ed Van Dice, R Price, Christ Judson, — Shady, A Dergin, William Dangerfield, Albert R Cassell, Robert Carlson, — Hans; Joe Birry and wife, Captain Seabery and George Powell. The Discovery was valued at $24,000 at the time of the loss and was insured for $12,000. Other reports of the fate of the Discovery state that all but one of the passengers who had started with the vessel at Nome, had quit the trip at Unga, Kodiak and Valdez claiming that the Discovery was not seaworthy. The remaining 26 persons aboard, mostly crew, were lost with the vessel somewhere between Middleton Island and Cross Sound. One questionable report from a claimed survivor has the vessel striking an iceberg at Cross Sound. The cabin of the Discovery was reported found in August of 1904, storm ravaged and buried in beach sand on Middleton Island. A second more credible report was published a year after the disappearance. Chief John of the Lituya Bay Native Tribe was said to have witnessed the loss of the Discovery the afternoon of November 2, 1903 outside of Lituya Bay. His story did not reach the south until late the following year. According to a credible source, the Chief watched as the Discovery attempted to enter the bay but the waterlogged vessel seemed out of control. After an hour or so the steamer was said to have gone down in the stormy seas with no chance for survivors. She was last seen attempting to round the point on the southern side of Lituya Bay. DIT OUT (1985) The fiberglass boat Dit Out was lost when her engine exploded July 23, 1985 just off of the Homer Harbor fuel dock. DOLORES (1992) The 28 foot salmon seiner Dolores became disabled in heavy seas and sank May 25, 1992 in Strawberry Channel. Both crewmembers were lifted to safety by a U S Coast Guard Helicopter. DOLPHIN (1977) The 38 ton 41 foot steel oil screw fishing vessel Dolphin foundered November 11, 1977 in Marmot Bay, Kodiak Island. DOMINION (1998) The 66 foot salmon seiner Dominion capsized and sank January 26, 1998 in the Shelikof Strait off of Cape Karluk. A bin board broke allowing the catch to shift causing the disaster. All three crewmembers aboard made it to safety. DONNA ANN (2003) The 58 foot wooden fishing vessel Donna Ann drug anchor and washed up on the beach at 2:40 a.m. August 20, 2003 in Tanglefoot Bay near Karluk. The crew abandoned ship and walked to Karluk. DONNA B (1992) The 33 foot fishing vessel Donna B capsized and sank July 21, 1992 at the entrance to the Kenai River. The five adults and infant that were on board all made it to safety. DONNA LEE (1954) The 8 ton 29 foot wooden gas screw fishing vessel Donna Lee foundered July 16, 1954 off of Kalgin Island in Cook Inlet. DONNA R (1973) The fishing vessel Donna R flooded and was lost January 1, 1973 in Port Etches, Prince William Sound. The vessel had a full load of fish and was waiting for a tender when she took on so much water that the crew couldn’t save her. DONNIE (1964) The 8 ton 28 foot wooden gas powered fishing vessel Donnie was destroyed by the earthquake and tidal wave of March 27, 1964 at Seward. DONNY BOY (1982) The fish tender Donny Boy grounded in high winds and was lost June 27, 1982 off of Castle Cape near Chignik. DORA B (1900) The small schooner Dora B broke her towline April 15, 1900 while being towed by the steamer Excelsior. They were at the entrance to Lituya Bay when the line parted and the Dora B was never heard from again. There were five persons aboard and a load of supplies bound for Lituya Bay miners. Lost with the schooner were Peter VanBuerden, Frank Rankin, George Cannon, a Japanese cook and an unknown miner. Wreckage was sighted outside of Yakutat and one body recovered. DORA H (1991) The 53 foot halibut longliner Dora H sank May 9, 1991 off of Chirikof Island. The crew was halibut fishing when the vessel began to take on water. They were unable to release their old life raft from its bracket but had a new life raft on board that was still in its crate. The four crewmembers struggled with the new raft in the water for over an hour before it was properly deployed. They were all rescued. DOROTHY H (1963) The 8 ton 27 foot wooden gas screw fishing vessel Dorothy H was consumed by fire July 9, 1963 at Chignik Lagoon. DOTTY G (1984) The seiner Dotty G capsized and sank while at anchor November 20, 1984 in Zaikof Bay on Montague Island. Winds were blowing at 90 knots when the vessel flipped. Darrel Dickenson (11) was lost. DOUBLE KNOT (1950) The 15 ton 34 foot wooden gas screw fishing vessel Double Knot stranded and was lost May 24, 1950, 15 miles east of Cape Saint Elias. Richard Albert Drisner (24) of Milwaukee OR was lost with the vessel. DOUBLE KNOT (1973) The 15 ton 34 foot wooden oil screw Double Knot disappeared with all hands March 27, 1973 near Nuka Bay, 60 miles south of Seward. The cause and exact location where the Double Knot and her four crewmembers were lost is not known. DOVE (1998) The 30 foot salmon gillnetter Dove capsized in the surf and was lost June 2, 1998 off of the Kokinhenik Bar in the Copper River Flats. The only person aboard was lost. DREAM GIRL (1967) The 14 ton 35 foot wooden oil screw fishing vessel Dream Girl burned July 23, 1967 at False Pass. DUCHESS (1996) The 79 foot wooden fishing vessel Duchess caught fire near Spruce Cape the evening of April 15, 1996. The three crewmembers were airlifted from the burning vessel by a helicopter from U S Coast Guard Kodiak Air Station. The Coast Guard cutter Storis responded and attempted to fight the fire but high winds and heavy seas hampered their efforts. The tug Chenaille Rouge arrived on scene and took the Duchess in tow but the vessel capsized and parted the towline. On April 17, 1996 the flooded Duchess grounded on Spruce Island and became a total loss. DUCK (1964) The barge Duck was destroyed by a tidal wave March 27, 1964 at Cordova. DUE NORTH (1980) The 58 foot fishing vessel Due North drug anchor and stranded October 6, 1980 in Alitak Bay. The crew was able to jump from the vessel to shore when the tide went out. DUPONT (1961) The 71 ton 59 foot wooden oil screw Dupont foundered July 8, 1961 approximately one mile south of Cape Suckling. All three crew members were removed safely by the tug Barbara Foss. DUTCHESS (1992) The 79 foot fishing vessel Dutchess sank near Uganik Bay in the Shelikof Strait May 17, 1992. A four persons aboard were rescued. DYLAN’S DREAM (1994) The 50 foot salmon seiner Dylan’s Dream was consumed by fire August 4, 1994 in Izhut Bay, Afognak Island. The five crewmembers abandoned the vessel in a skiff and were rescued by the fishing vessel Cape Lookout. The Cape Lookout took the Dylan’s Dream under tow but the vessel burned to the waterline and became a complete loss. DYNAMITE KID (1964) The 33 ton 50 foot wooden oil screw fishing vessel Dynamite Kid foundered May 4, 1964 about 16 miles off of Point Pogibshi in Cook Inlet.